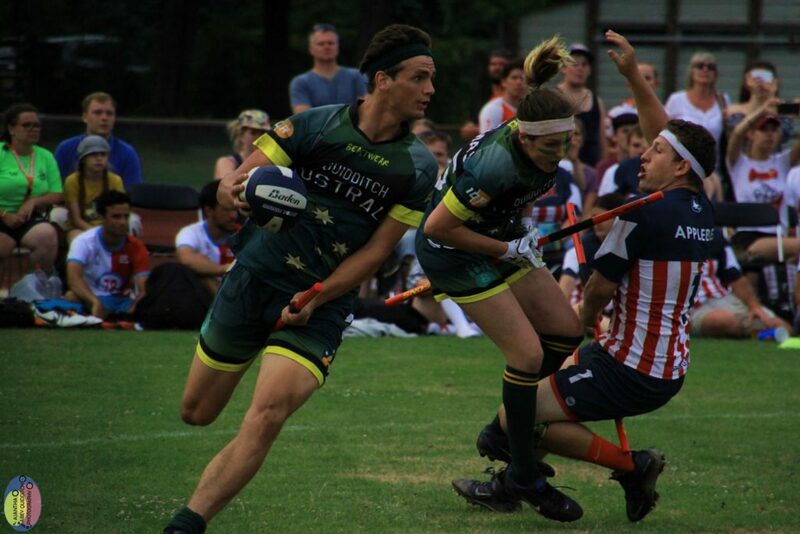 Team Australia made history on Sunday, upsetting Team USA in the final of the IQA World Cup. 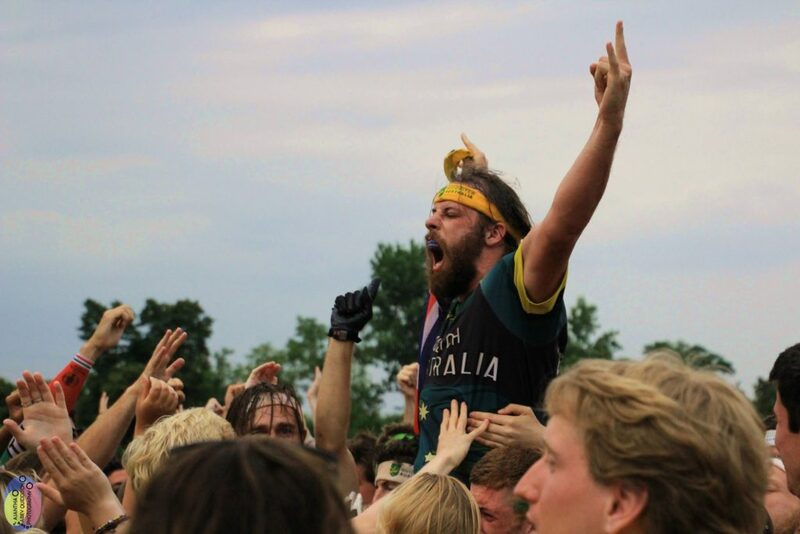 With the trophy heading to the southern hemisphere and the dust settling on #IQAforums, it’s time to sift through the film to break down Australia’s victory over 2012 and 2014 champion Team USA. In possessions one to eight, the Dropbears managed to run out to a 20-0 lead. Additionally, they managed to hold bludger control for six possessions to the USA’s two during this period. USA changed things up after going down early, subbing most of the chaser line and bringing on beaters Ashley Calhoun and, a little later, Max Havlin. From possessions eight to 24, the pairs of Michael Duquette/Calhoun and Havlin/Calhoun maintained uninterrupted bludger control and the team went on a 70-30 run. Australia, however, managed to keep the USA just close enough. Keeper Callum Mayling deserves a lot of credit for this—dishing out an assist to Taya Rawson, driving one in over two USA defenders and draining a mid–range shot to score or assist all of Australia’s goals. They imposed a drive-heavy game. One of the biggest surprises of the tournament was how teams matched the USA’s physicality. The Americans have undoubtedly been the most physical team in the game and probably still are. Driving against them in previous incarnations has resulted in eating grass—repeatedly. However, the USA quaffle players missed 18 of 19 tackles in this final. While Australia also couldn’t make tackles stick—missing seven out of an attempted eight—this wasn’t unexpected. Australia raised their game and managed to get past point defenders repeatedly, sometimes using picks set by the off–ball chaser and sometimes, simply, driving straight through or around the defender. They made the most of bludger control. 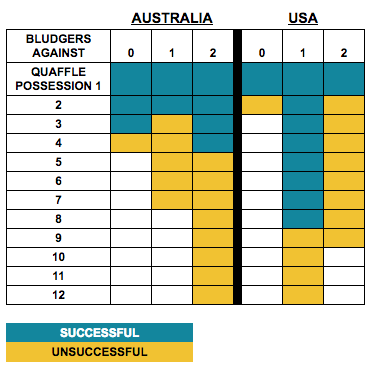 The Australians managed to hold bludger control on 18 possessions to the USA’s 26 before snitch-on-pitch. Given how dominant the American beaters were expected to be, this has to be unexpectedly high. The chart below shows both teams’ efficiency on offense. Team USA only managed to score one goal in their nine possessions against two bludgers. This happened partly due to great play by the Australian beaters—who managed to force errors from the American offense—and partly due to bad decisions from the USA quaffle players. They pulled the winning ticket in the snitch-on-pitch lottery. 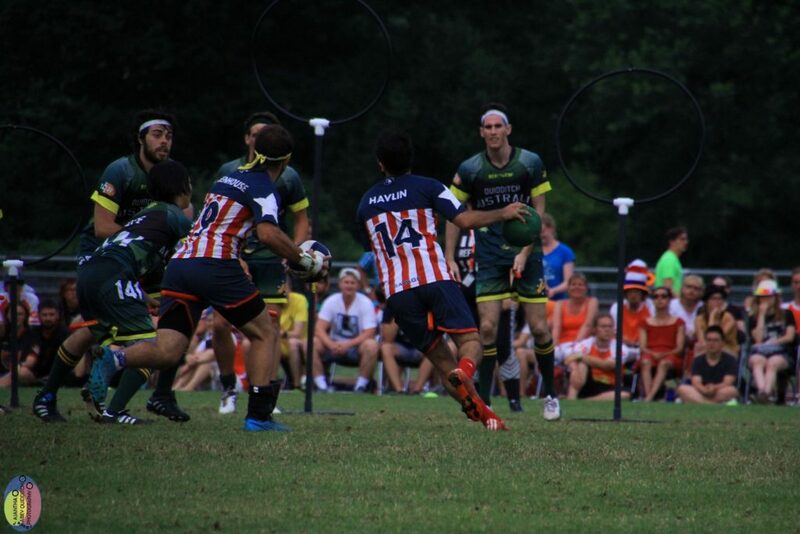 When the snitch was on pitch, neither team prioritized the quaffle game and focused all their efforts on the snitch. Both teams scored three goals each with most plays consisting of drives against no bludgers. Both teams caught the snitch once. One was called good, the other was not. And, on that toss of a coin, we have the biggest result in quidditch’s history. Stats talk, and Team Australia earned the title of World Cup Champion through beater skill, competitive physicality and the sheer will to stay in the fight.